Our garden has an automatic irrigation system, but once in awhile my husband uses a hose to rinse the dust from the leaves of the plants. I grabbed my point-an-shoot camera and snapped this photo of an 'Ecstasy' hibiscus blossom right after such a dousing. I think the hibiscus liked getting sprinkled. Wow, what a beautiful shot and what a beautiful hibiscus. I love the colors! What a gorgeous color Bobbie!. I love Hibiscus, and I have 2 IF the Japanese Beetles don't eat them. That is a beautiful and different hibiscus than I have ever seen. Thanks, everyone. 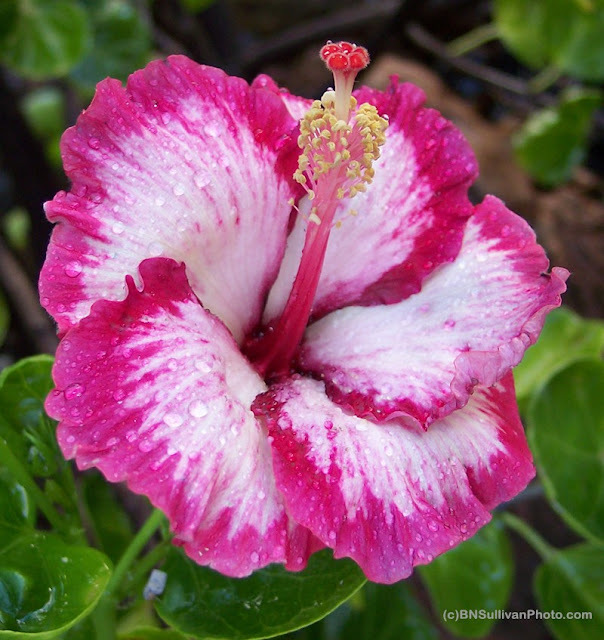 This hibiscus variety is one of our favorites, too. Becky, I hope you're able to fend off the Japanese beetles! Thanks for the kind words about my flower photos. Since you have asked so nicely, you may use this photo for your Facebook profile, so long as you do not remove the copyright line on the lower right of the photo.